In Katherine Gehl’s presentation, she proposes reforms necessary to align the political system with the public interest. What would be required to actually change the political outcomes we are experiencing? What would it take to better align the political system with the public interest and make progress on the nation’s problems? The reforms she proposes constitute a cohesive strategy that will alter the incentives that drive behavior in the political system. In September 2017, Katherine and Michael E. Porter of Harvard Business School released their report “Why Competition in the Politics Industry Is Failing America: A Strategy for Reinvigorating Our Democracy.” Like Michael, Katherine is not a political scientist, political insider or political expert. She brings an entirely new analytical lens to understanding the performance of our political system: the lens of industry competition. This type of analysis has been used for decades to understand competition in other industries, and sheds new light on the failure of politics because politics in America has become a major industry that works like other industries. Katherine M. Gehl is a business leader, author and speaker. 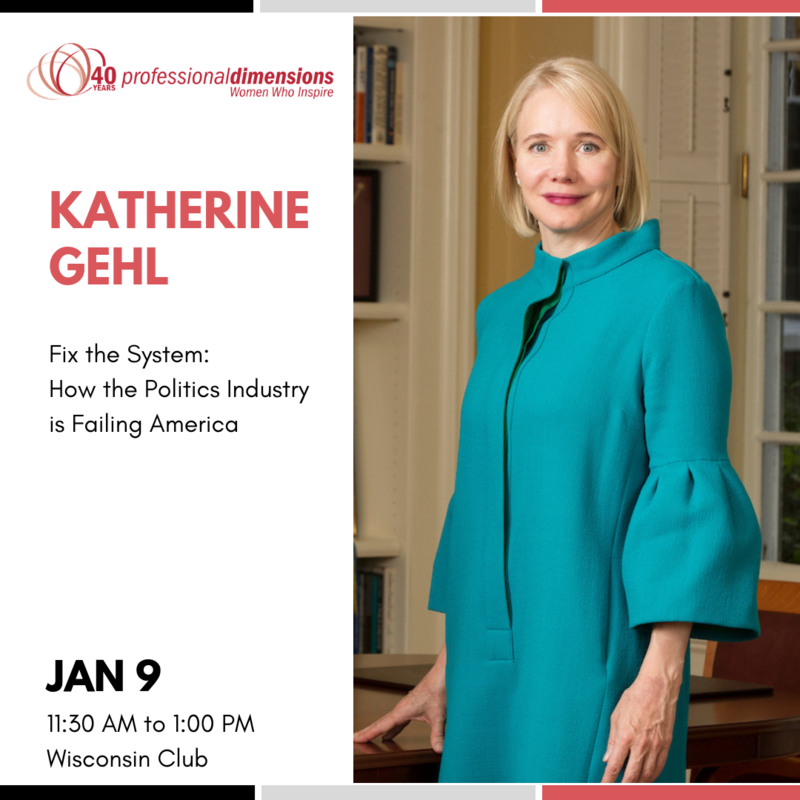 Katherine was president and CEO of Gehl Foods, a $250 Million high-tech food manufacturing company in Wisconsin where she led a transformational growth strategy, receiving multiple awards, before selling the company in 2015—in part to dedicate more time to political reform. Her career includes roles in the private and public sectors including at Oracle Corporation, Bernstein Investment Research and Management, Mayor Richard M. Daley’s Office at the City of Chicago, and Chicago Public Schools. In 2011, Katherine was confirmed by the U.S. Senate to serve on the Board of the Overseas Private Investment Corporation. Today, Katherine describes herself as a political innovation activist. ravioli topped with burgundy mushroom glaze, shaved parmesan and balsamic micro greens.